← A plastic ATV gas tank on a Virago 250 – how bad would it look? · I have started polishing the left engine cover. I only hand-polish, so it will take about eight hours – a lot less if I do the paint sanding step with the engine hot. · The “delete left side plastic cover and expose regulator mod.” I removed the left side plastic cover, and polished and waterproofed the voltage regulator. I will be leaving the cover off permanently – I like the looks of the voltage regulator, even though the cooling fins orientation does not match the engine. On some Virago 250’s, the voltage regulator runs too hot – I do not think that mine has that problem but being in the open air should help a little to keep it cooler. · I do not recommend this mod: partially expose front sprocket by removing lower part of front sprocket cover. This mod reduces safety so I do not recommend it. (If you do it anyway, make sure your chain is in excellent condition and you always wear boots when you ride.) What I like about this mod is that you can polish the front sprocket and you can keep that area clean. On the bikes that I have owned, that area always has lots of dirt and grease. 1) New handlebar design consists of a flat bar with chromed risers. Yamaha claims that this new handlebar improves the riding position, rider comfort, and styling. The object that is about to hit you, you probably do not see it yet. This entry was posted in Motorcycles and tagged Free chrome, Low cost mods, Polish, Polishing, V-Star 250, Virago 250, Virago 250 custom. Bookmark the permalink. I see you have a centerstand on this bike, Custom fabricated? Where/How might I go about getting something like that for mine? 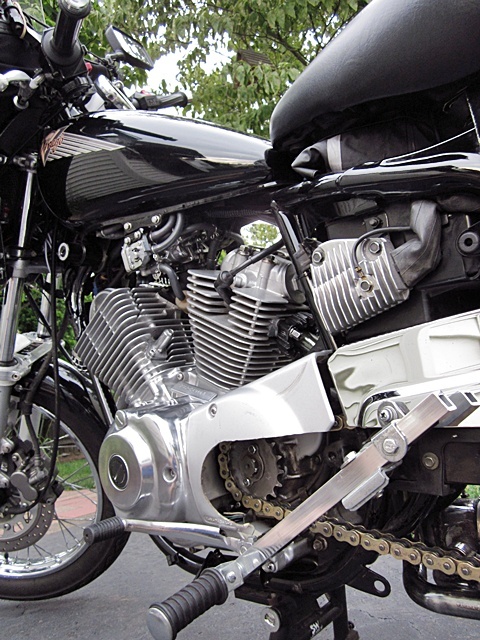 Centerstands are hard to find for the Virago 250. I found mine (SWM) on ebay; the seller had only one. The one that I bought is a SWM center stand for the European model Yamaha V-Star XVS125 and XVS250 – you can put in on a Virago 250 but it requires modifications. I think that SWM no longer makes a center stand for a Virago 250. The SWM center stand for the European model Yamaha V-Star XVS125 and XVS250 does not fit the Virago 250 without modifications – I would not recommend this unless you are pretty handy. The height of this V-Star XVS125/XVS250 center stand is 7.6875 inches or 195 mm, and the pivot rod width is 7.375 inches or 187 mm. You could put a center stand from another bike on your Virago 250, but most center stands from other bikes will not fit, so finding one would be difficult. 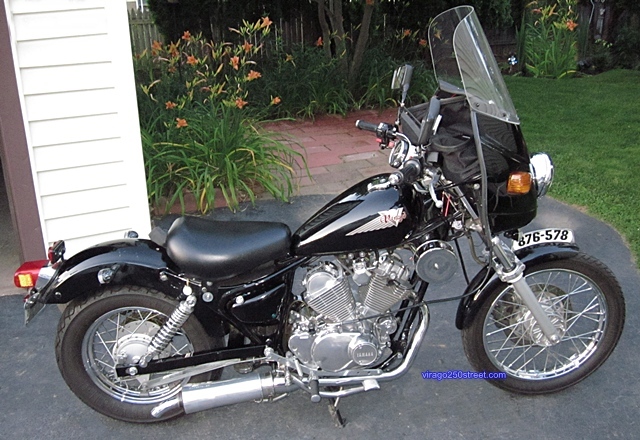 The height of the Virago 250 center stand needs to be about 7.375 inches or 187 mm, or just a little less than that. If the center stand you find is just a little short, you can add a spacer to the mounting plate or add to the feet of the stand to make the stand the proper length. 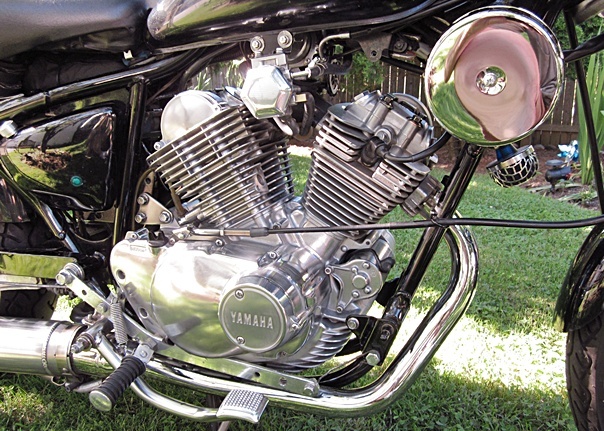 For notes on installation, please the posting “Adding a centerstand to a Virago 250” http://wp.me/P1LWaM-gz and the comments. The Virago 250 is one of the greatest little motorcycle ever built. It is small enough for people learning to ride or of small of stature to ride safely. It is big enough for a rather tallish gent can ride comfortably very near a larger bike. A bike that can handle short and tall people well is an excellent work of engineering. The looks of the perky Virago 250 are very similar to Harley Davidson FXR. One reason I bought mine. A baby FXR!